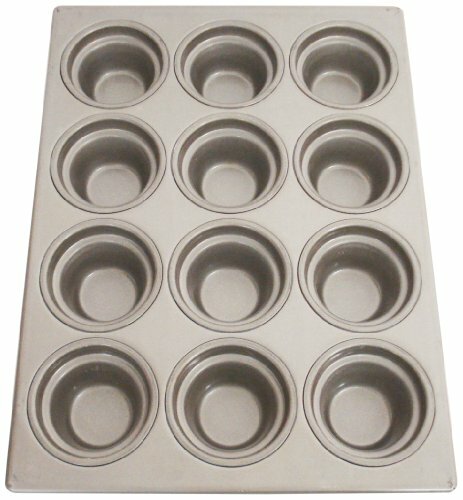 Magna Industries crown muffin pan can bake 12 muffins or cupcakes at once making it perfect for brunches and parties. Constructed of professional weight 22-gauge aluminized steel, it resists corrosion and provides an even heating performance. Arrangement: 3 x 4 cups, each holds 7.3 ounces, vertical depth is 1-15/16-inches, top in: 3-1/2 inches, bottom out: 2-1/16 inches. 5/16-inches diameter wire in rim. Cookie sheet style. Center Cup-to-Cup measures 4-1/8-inches length by 4-1/8-inches width. The liquid volume if filled to brim - uses 60 - 70 percent for batter weight. Overall measures 17-7/8-inches length by 13-1/8-inches width.